[BENJAMIN BUTLER]. 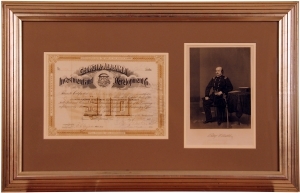 Stock certificate of fifteen shares of the Georgia Investment and Development Co. signed by Benjamin Butler as President. March 14, 1891. Framed (non-archival). Benjamin Franklin Butler (1818-1893), American general and politician, born in Deerfield, New Hampshire. He was educated at Waterville College (now Colby College), Maine, and admitted to the bar in 1840. After a career in criminal law and as a Massachusetts state legislator (as a member of the Democratic Party), he became brigadier general of the Massachusetts militia and major general of volunteers in the American Civil War (1861-1865). He commanded the land forces that captured New Orleans and for seven months (May-December 1862) was military governor of the city. His arbitrary rule provoked charges of corruption, earned him the name Beast Butler, and caused his dismissal as governor. He later commanded the Army of the James in Virginia. Butler, having become a member of the Republican Party, served in the U.S. House of Representatives from 1867 to 1875. From 1877 to 1879 he served another term in Congress, as a member of the Greenback Party. He rejoined the Democratic Party and was elected governor of Massachusetts in 1882, serving until 1884, the year he became the unsuccessful presidential candidate of the Anti-Monopoly Party and the Greenback-Labor Party.